Tyrannosaurus, meaning 'tyrant lizard' is a genus of theropod dinosaur. The species Tyrannosaurus rex, commonly abbreviated to T. rex, is one of the dinosaurs most often featured in popular culture around the world. It hails from what is now western North America. Some scientists consider Tarbosaurus bataar from Asia to represent a second species of Tyrannosaurus, while others maintain Tarbosaurus as a separate genus. Like other tyrannosaurids, Tyrannosaurus was a bipedal carnivore with a massive skull balanced by a long, heavy tail. Relative to the large and powerful hindlimbs, Tyrannosaurus forelimbs were small and retained only two digits. Although other theropods rivaled or exceeded T. rex in size, it was the largest known tyrannosaurid and one of the largest known land predators, measuring over 13 metres (43 feet) in length and up to 6.8 metric tons (7.5 short tons) in weight. Fossils of T. rex have been found in North American rock formations dating to the last three million years of the Cretaceous Period at the end of the Maastrichtian stage, approximately 68.5 to 65.5 million years ago; it was among the last dinosaurs to exist prior to the Cretaceous-Tertiary extinction event. 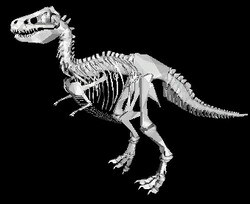 More than 30 specimens of T. rex have been identified, some of which are nearly complete skeletons. Some researchers claim to have discovered soft tissue as well. The abundance of fossil material has allowed significant research into many aspects of its biology, including life history and biomechanics. The feeding habits, physiology and potential speed of T. rex are a few of the topics which remain controversial. You may need to download and install the required plugins before you continue on to the museum.